'Rasagola' is also spelt as Rasgulla and it is the cause of dispute between the two states of Odisha and Bengal, both of which claim the sweet delicacy to be their own. 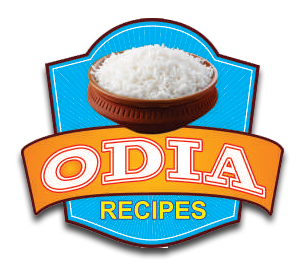 Historically it first made its appearance as a 'bhoga' offered to Lord Jagannath of Puri in the 12th century. 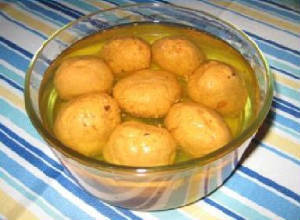 Pahala village on the Cuttack-Bhubaneswar Road is well known for the typical kind of Rasgulla made there. MAKING OF CHENNA: Heat milk in a pan over a medium heat and bring it to boil for about 10 minutes. Add lemon juice and stir it well. Paneer (Chenna) will separate out and when you see clear water, turn off the flame. Let it cool for 10-15 mins. Then drain off all the water, put paneer on a muslin cloth over a strainer. Wash paneer with fresh water to get rid off the lemon smell. Then squeeze the muslin cloth with paneer and tie a knot to remove all water from the paneer. Leave it aside for 4-5 hrs or overnight. MAKING OF RASAOLA & SUGAR SYRUP: Put the paneer in a container, add flour and fine cardamoms powder (optional) and knead the paneer to make it soft and smooth. (Tips: the more you knead the more soft the rasagola's will be). Then make small paneer balls and keep it aside. (Tips: to make the rasagola pink which is typical of Orissa Rasagola, put a small sugar caramel piece in the center of the paneer while making each ball. To make sugar carmel- Take 1 tsp of sugar and fry it on a heated pan for couple of minutes which will first turn brown liquid then turn into hard brown coloured sugar solid, after cooling down, you can break it into tiny pieces with your hand). For sugar syrup, mix 2 cups of water and 2 cups of sugar, cardamom powder, rose water in a pressure cooker and put the paneer balls in the cold mix. Make sure that you add enough sugar water to dip the balls. Then cook the balls for 30-45 mins over a low to medium heat in the pressure cooker. Usually after 2 whistle over medium heat, your Rasagola's are ready. It really tastes like famous Pahala Rasagola of Odisha. Rimpy Yadav - "Best for festive season. Delicious "